This is a no-brainer. 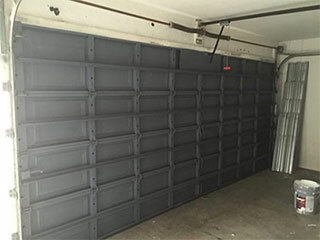 Just like a bike gear or car engine, garage doors contain moving components that need to be greased up from time to time. Lack of lubrication causes dryness which in turn will lead to abrasion of the component and eventually it will become damaged. Be sure to lubricate your door every three months using standard lubricant from your local hardware store, according to the manufacturer’s recommendations of course. Now, read carefully: I said “inspect” not “tamper with” or “attempt to repair”. A lot of tragedies have resulted from attempts to work on springs under high tension by novices. Spare yourself the pain. All you need to do here is observe the physical state of the cables. If you spot any wear and tear it's time to get your cables replaced. Otherwise, your door is good to go. Also check the brackets where the cables are attached for signs of damage. Garage doors have one job: to open and close - and they do this more than a thousand times yearly. You bet there will be consequences for moving that number of times. Over time, the vibration from this up and down movement causes the nuts and bolts to loosen up a bit, making your door rattle as it operates. This is why it's good practice to tighten the various components (bolts, roller brackets, hinges, etc.) once in a while to keep everything snug. But not too snug. It’s important that you run a check on your rollers at least twice a year. Rollers help to ease the drag on the door as it is pulled up. If the rollers are damaged it will cause the opener and spring to do more work, undermining their condition in the process. If the rollers appear cracked, worn-out, or missing a few bits then it’s time to replace them. Inspect your garage door tracks regularly and keep them free from grit or tiny fragments of sand metal. A gritty track means more work for the rollers, openers, and springs. Just carry out simple cleaning with a firm brush. If there’s a major repair to be done on the tracks, our advice is to leave it to the pros!